Sverd i fjell (literally ‘Swords in Rock’) was a non-negotiable landmark on my Stavanger list from the very start. 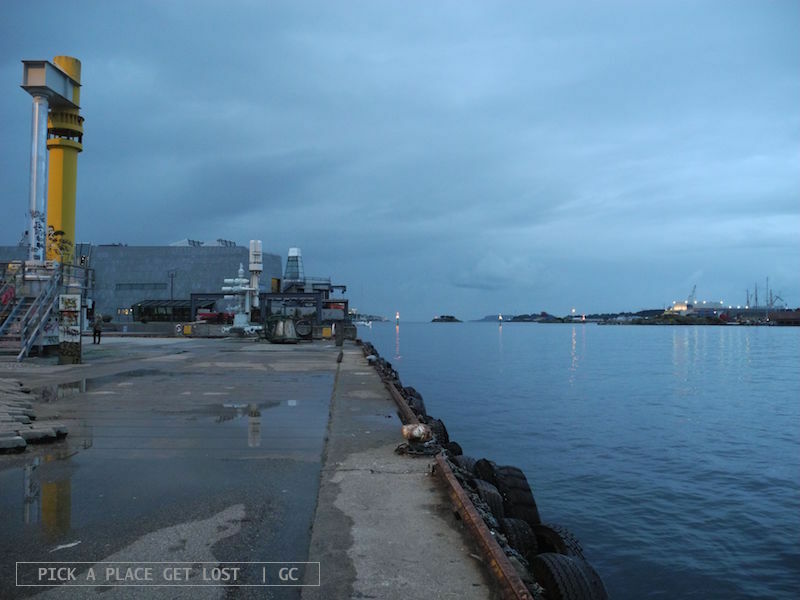 As soon as I knew I was going to Stavanger I started looking for things to see and places to visit. As soon as I came across a photo of the Viking swords I knew I had to see them. 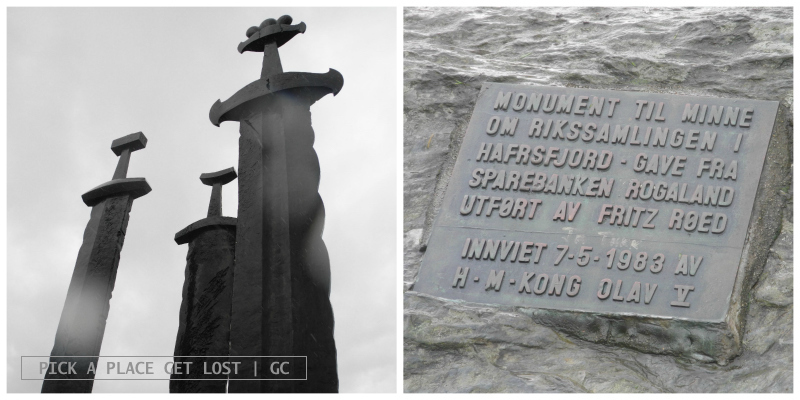 This 10-metre-tall monument consists (predictably enough) of three swords planted in the rocky ground of a hill by the Hafrsfjord. The monument commemorates the Battle of Hafrsfjord, which took place in 872 and reunited the whole of Norway under the crown of King Harald. I didn’t even bother to check how far it was from Stavanger. I simply left the hostel quite early in the morning and started walking in what looked on the map like the direction to the monument. Soon enough I was out of Stavanger, and strolling down a hilly road with colourful Norwegian houses on both sides. How nice! Some 15 minutes later I was still strolling down the same hilly road with coloured Norwegian houses on both sides. Still nice, but no Sverd i fjell in sight, and no one around to ask for directions, or how far I was. Then a man appeared out of nowhere outside his house. 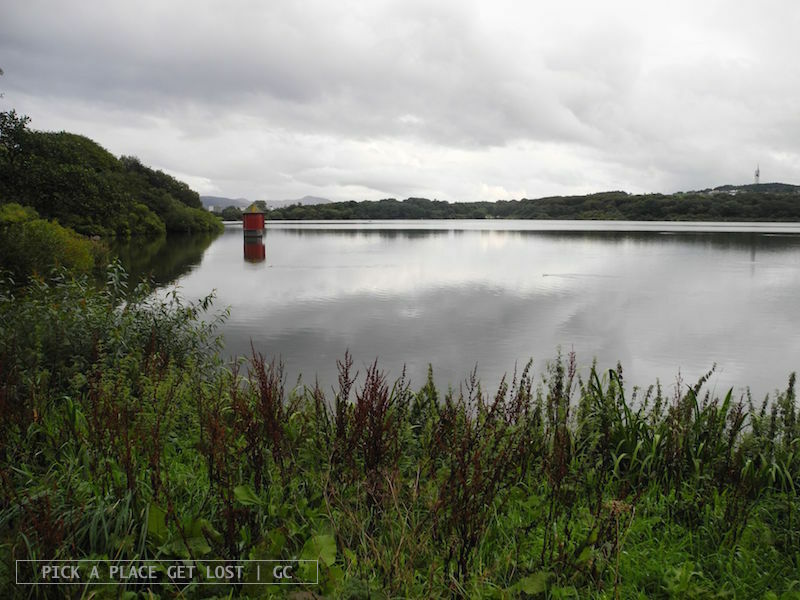 He said I was going in the right direction, but it was still quite a walk. Fair enough, I thought. I’m in no hurry at all. My night train to Oslo departs shortly before midnight, so I literally have the whole day. As soon as I resumed walking, needless to say, it started raining. Hard. Then harder. Then, ten minutes later, even harder. It got windy as well, and by then I only had meadows on both sides, so I had no shelter whatsoever. Every now and then a car drove past, which made my clothes even damper. I was officially soppy wet. A car drove by, but then it slowed down, till it came to a halt right next to me. ‘Hey, do you need a ride to the monument? Jump in!’. I turned around, and there he was, the man I’d asked for directions earlier. Yay. The car ride only took ten minutes, but it was so relieving. And pleasant. We talked about Norway, weather and Italy. The usual topics of desultory conversation. He dropped me off by the water, across the street from the bus stop (there was a bus?!? ), right in front of the monument. Thank you, unknown kind person. I walked uphill a few steps, and there they were in front of me. 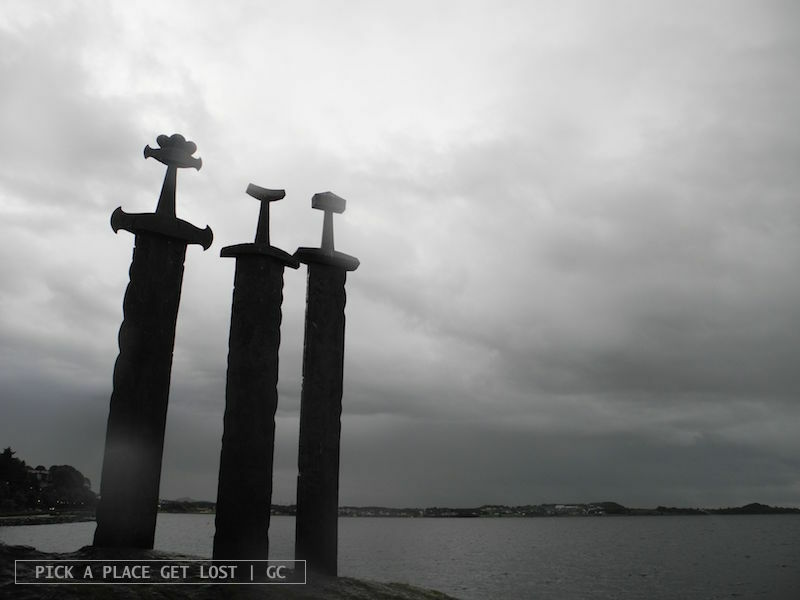 The three swords stood majestic and huge against the dark grey of the water. It was pouring with rain, which made them look even mightier, as I got closer. They were beautiful. They looked like they’d been there forever, like that was exactly where they belonged, and that rocky spot had been prepared specially for them. Coincidentally, I reached the hill where the monument stood when a group of kids in rain slickers was just about to start a picnic on the shore. A picnic in the rain. How can you not love the Norwegian way. If one looked at the scenery from a distance, one would have seen the green of the hills, the grey of the rocks, the bronze swords towering over the fjord, and a bunch of brightly coloured tiny dots jumping and running all over the place. 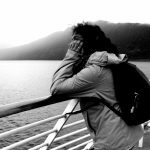 I spent something like half an hour, if not longer, standing on the rocks, my eyes moving between the fjord and the swords, a large beam spread across my face. I still remember that view as one of the most unique sceneries I’ve ever seen. I’d like to see what it looks like on a sunny day. The landscape would probably be even more breathtaking, even more so when the air is clear. But I doubt the overall effect would be as powerful as it was when I saw it, what with the heavy clouds and the misty horizon. 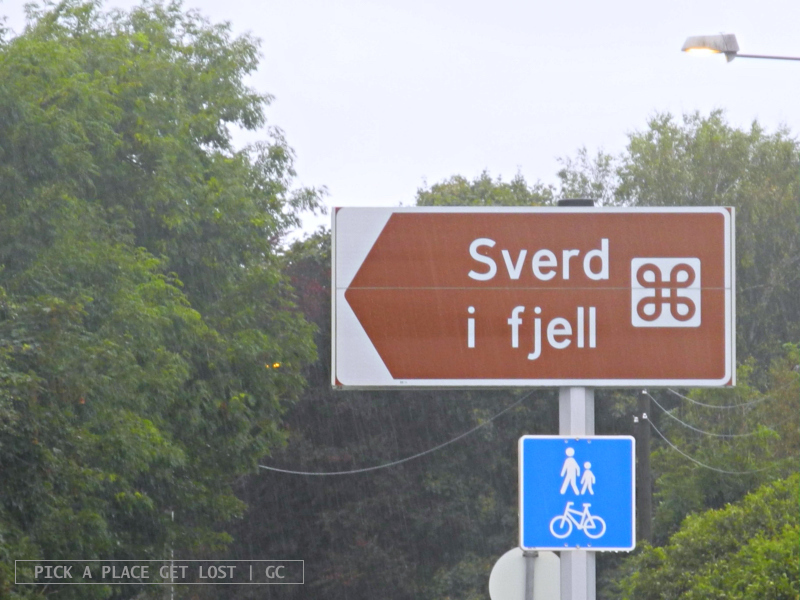 But then, what really makes the difference is certainly not the weather, it’s whether one goes to Sverd i fjell or not. I’d say: go, without a doubt, go. And if you don’t feel like walking (or hitchhiking) to the swords, take bus 16 from Stavanger city centre and get off at Madlaleiren. Walk 200 metres down the main road and you’ll see them. I went to the bus stop happy as a clam. I spent the rest of the day around museums, as the rain wouldn’t stop, and I had already been around the city centre. First, I went to the Canning Museum, where I found shelter purely by accident. It was raining particularly hard, and I could choose to run to the building on the right- or the one on the left-hand side of the street. I picked the one on the left, and it turned out to be a great choice on my part. 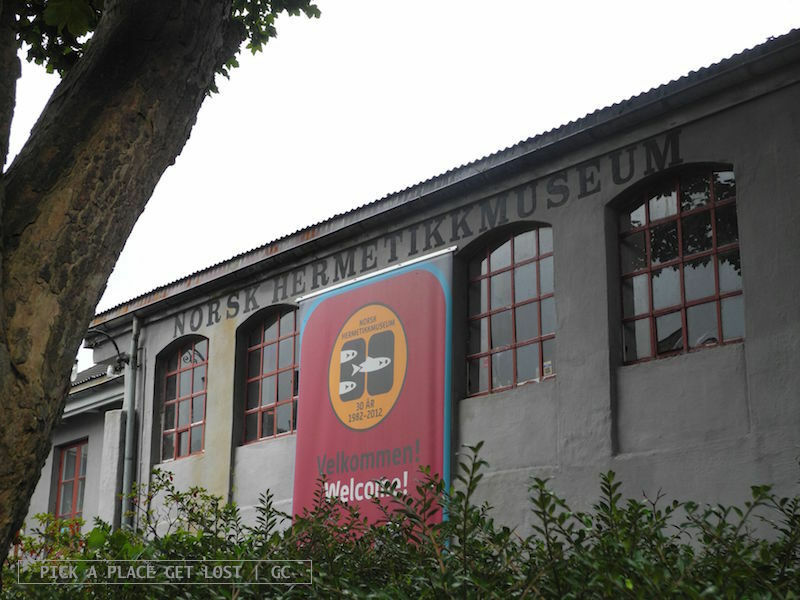 Visiting that museum was such fun! The Oil Museum I’d already visited, so I went on to the Maritime Museum, which was also very interesting. (Maritime Museums are beautiful.) I finished my afternoon at Mosvatnet, a roundish pond circled by green just outside the centre, and one of the quietest spots I’ve been to, populated by runners, locals going for a stroll, and ducks. Around dinner time I went back to the pier. I treated myself to pizza and beer at Peppe’s Pizza, before heading back to the railway station, where I’d stored my bag in a locker so as not to drag it around all day. See you soon, Oslo. Goodbye Stavanger, miss you already. 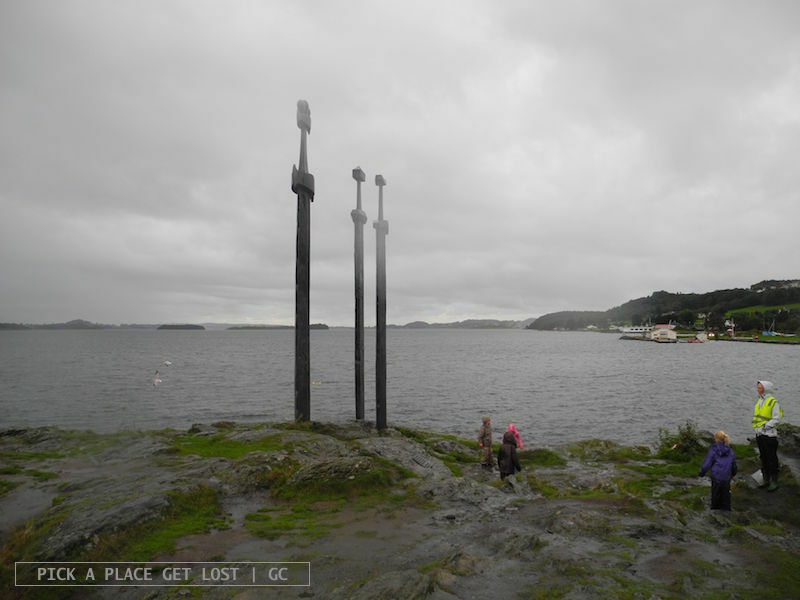 This entry was posted in Norway, Norway 2013 and tagged mosvatnet, norway, norway 2013, stavanger, stavanger canning museum, stavanger maritime museum, sverd i fjell, swords in rock by Giorgia. Bookmark the permalink.